GKN received a regional quality award from Jatco. GKN Sinter Metals has received a quality award from automotive supplier Jatco for its Japanese business. Jatco, which also makes automotive transmissions, has partnered with GKN since 2009. Each year, Jatco awards companies that produce over a 15 month period with a defect rate of zero parts per million (PPM). 'This is a great encouragement for all of us who are working endlessly to deliver on increased customer requests,' said Leo Zhang, sales and marketing manager, GKN Sinter Metals. This story is reprinted from material from GKN, with editorial changes made by Materials Today. The views expressed in this article do not necessarily represent those of Elsevier. 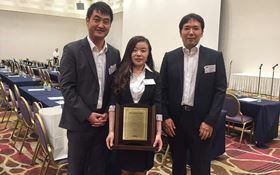 GKN Sinter Metals has been recognized by Jatco with the Regional Quality Award for efforts in the supplier’s Japanese business. GKN Aerospace has received a supplier award from Spirit AeroSystems. GKN Aerospace has signed (LTA with Mitsubishi Heavy Industries Ltd (MHI).